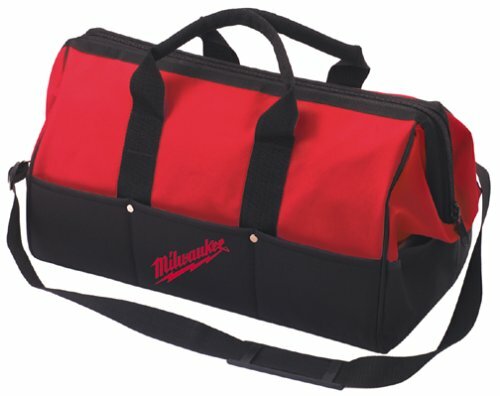 For this post, I have put together a collection of the best tool bags currently available. The following tool bags use the latest innovative components to meet your needs and help to ensure you do your best work. So here is my list of The 10 Best Tool Bags. The CLC 1539 large multi-compartment tool carrier is the ultimate tool carrier, providing ample space for a wide variety of tools, parts, and accessories, all in one durable bag. Large main inner compartment holds a variety of hand and power tools. Large outer compartments with 18 pockets each. Main compartments close with heavy-duty, double-pull zippers. 7 exterior pockets, large carabiner, and measuring tape clip. Textured, padded, adjustable shoulder strap and padded carrying handles. Heavy-duty poly fabric body with poly ballistic trim and binding. 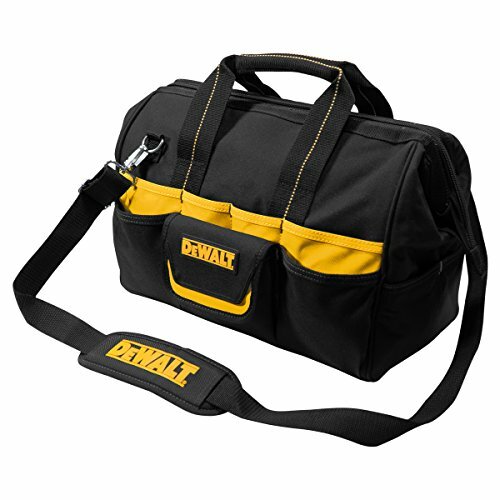 The 16-inch DEWALT tool bag by CLC with pop open design and large interior compartment allows you easy access to tools and parts. 14 interior pockets including zippered pocket to secure valuables makes this the best choice for all contractors. Features four base pads to protect bottom from wet and dirty conditions. 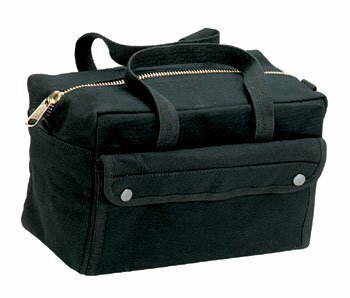 Large mouth opening of this tool bag allows easy access and the large interior compartment allows for easy access to tools and parts. Ballistic poly fabric this is constructed with is flexible to the touch and stronger than traditional fabrics. Features an adjustable, non-slip padded shoulder strap with non-slip handle make carrying more comfortable. 20 exterior pockets allow for hundreds of organization options. 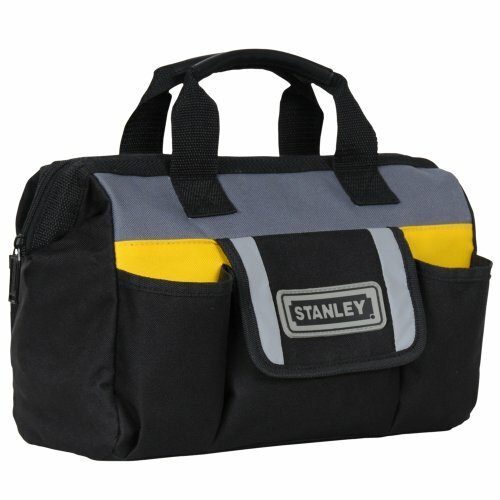 Stanley STST70574 12-Inch Tool Bag is ideal for carrying hand tools and other small to medium-sized items. Adjustable strap allows for easy access to contents. Rubber foam bottom keeps bag sturdy and helps protect contents from hard falls. Outer mesh pocket stores personal items. Rothco G.I. Type Mechanics Tool Bag is constructed of heavyweight cotton canvas, that doesn't lose its shape. 2 outside button snap pockets, ideal for small components. 8 inside tool organizer pockets to store your quick access items. 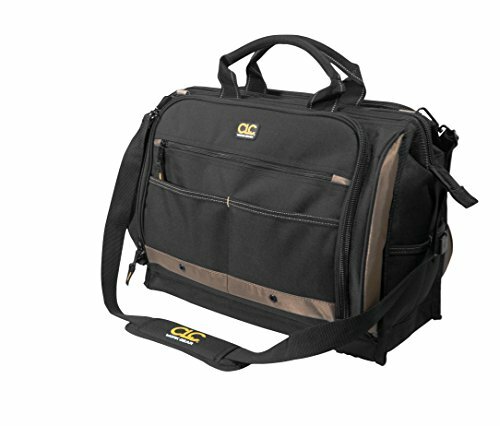 Features a canvas carry strap for easy transportation. Full length durable nylon zipper closure. Bag measures 11" x 7" x 6". 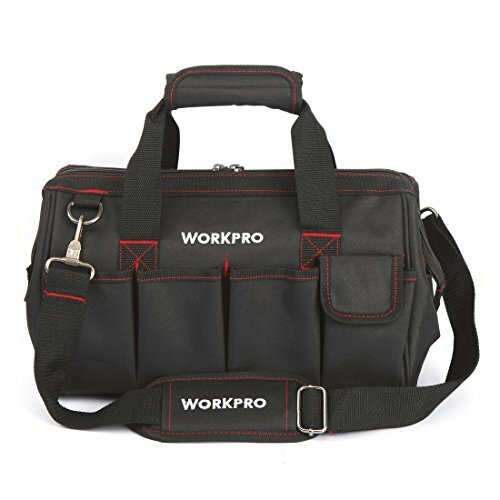 WORKPRO 14-inch Tool Storage Bag Close Top Wide Mouth Open tool bag is constructed with rugged 500D polyester fabric and will stand the test of time. Various of pockets and large space to organize a variety of wrenches, pliers, screwdrivers, meters, and accessories. Tools are easily and conveniently accessible due to stay-open top. Rubber foam bottom keeps bag sturdy, protects contents from hard falls. Top double-pull zipped,you can with the zipper from both side to close the bag conveniently and smoothly. Extra padded handle and adjustable shoulder strap add extra comfort when carrying of heavy loads and allow for safe and secure transit. By using the CRAFTSMAN 13 in. tool bag all your small hand and power tools will be at your fingertips. Over sized zipper tops makes tools easy to store and retrieve. Tiny tools and accessories are clearly visible when stored in the sturdy mesh pockets on the outside of the bag. Constructed from heavy duty flexible material that takes up less space than bags made from stiff materials. Extra strong zippers and materials won't tear or rip when exposed to sharp edges or pointed ends. Large openings let you see all the contents of the bags instead of groping in darkness for familiar shapes. 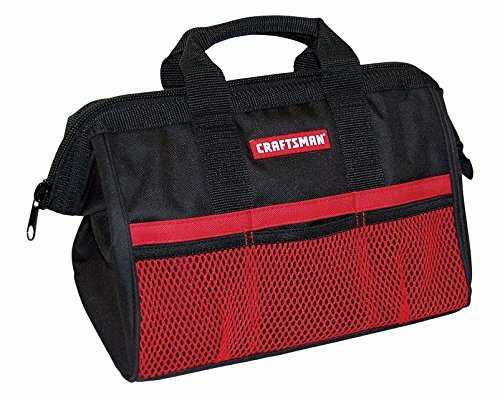 Internet’s Best Soft-Sided Tool Bag is the perfect item to stow away power tools, medium hand tools and other smaller construction items. 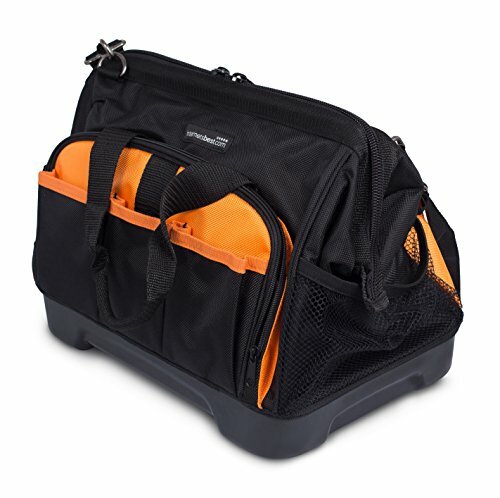 Made from durable 600d fabric, the soft sided tool bag can endure hard wear and tear. Equipped with a waterproof, sturdy rigid base, feel free to leave your tool bag on the damp ground without water seeping through it. Constructed with a wide mouth opening to allow easy access for larger power tool units. Simply zip up the top for to conceal tools and hardware. 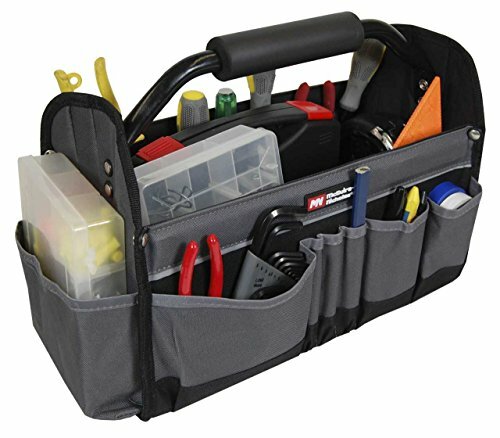 Organize all your tools within the 16 pockets and open main compartment. Includes soft fabric handles and a padded shoulder strap for ease of transportation. 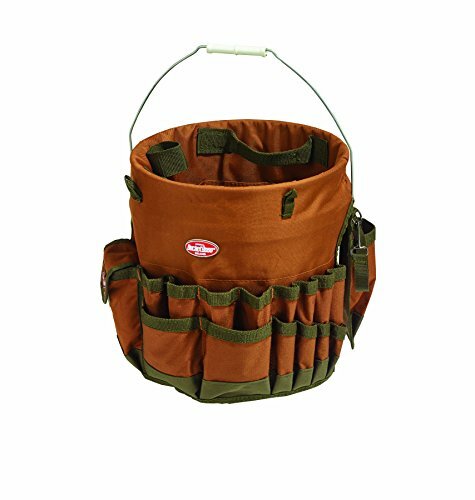 The Bucket Boss Bucketeer BTO is the original bucket tool organizer. The BTO gives you the ability to hold plenty of your hand tools in a 5 Gal. bucket. Fits any 5 gal. bucket. Easily locate your tools inside and outside the bucket. 3 interior loops for hammers, drills, pry bars or other long tools. 30 assorted storage pockets: 22 outside and 8 inside. Poly rip stop/600d poly material. The collapsible tote allows for multi-use functionality for all your storage needs. Built with several pocket styles there should not be any problems with holding tools of various sizes. Padded handle for carrying comfort. Outer pockets for additional storage. Collapsible tote with removable bottom for easy storage. Inside: webbed loops to accommodate 7 tools on each side (14 total). Soft Side Contractor Bag made of tough water resistant 600 denier material. Provides extra storage for job site tools and accessories. Durable zipper closure. 20-1/2 inches long by 9 inches wide by 8 inches high. I hope this list of the best tool bags was helpful.